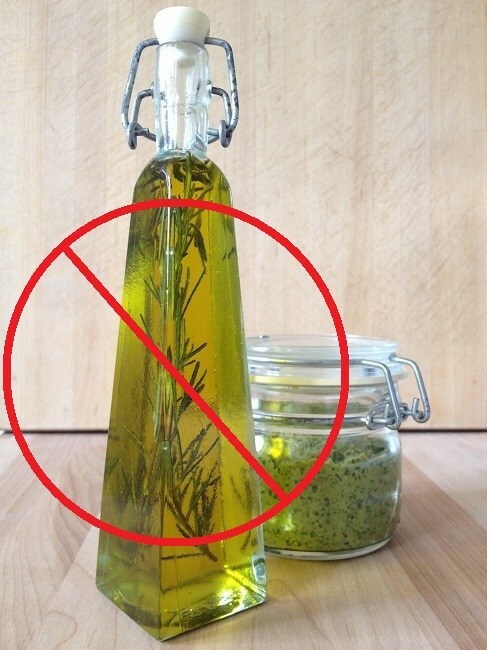 RETRACTION: Do NOT put fresh herbs in oil! When I wrote my last post earlier today and published it, I was completely unaware that botulism grows on fresh herbs and becomes dangerous when we infuse oil with them, as I had done just this morning with the bottle you see here. Thanks to my friend and sister blogger, Margaret Schindel, who, by the way, is a wonderful cook and posts amazing recipes, I now understand that such a combination could make us very sick or even cause death. According to the University of Maine Cooperative Extension office in their article, Safe Homemade Flavored and Infused Oils, fresh herbs contain the bacteria, Clostridium botulinum (C. bot), which can cause botulism, a lethal poison. Because oil provides an oxygen-free environment, the botulism can multiply and grow when fresh herbs are bottled with the oil. Eating such herb-infused oil could make us very sick, even kill us. As soon as I finish writing this post, I will discard this oil and the herb. Please read the linked article and do NOT try this at home! I have been gifted such home-infused oils in the past, as well as received commercially-prepared herb-infused oils as gifts and had no idea they could be dangerous. Did you? According to the article linked above, commercial producers use a process that acidifies the oil environment so the botulism cannot grow. If you want to make an herb-infused oil, please read the article and follow their instructions carefully. I apologize for not knowing that this practice is unsafe. Please pass the word along. I had no idea and this is good to know! Coincidentally, I had planned on making some herb-ed olive oil as gifts for people for Christmas and will read the extended information so I can make it safely! Thank you! Oh, Tootie, thank you for letting me know. I’m glad I could help. You are most welcome. I am working on a follow-up post on botulism, which includes information from the CDC and other well-respected sources, and am grateful for your sharing the link. As I do more research on this topic, and hear from friends, family and readers who also were not aware of this danger, I realize just how much we have lost in becoming a society that takes so many of its meals outside the home. More to come on food safety! Thank you so much, Kathryn Grace, for posting this important information. I tried making infused oil several years ago, but it didn’t work well for me, so I trashed it. Soooo glad I did. You’re welcome, Maria. I wonder how many other people have tried this at home, not knowing about the danger. Oh, that’s a good question. If infusing oil with herbs is a problem, what about adding them directly to hot oil in the pan….? Oh Yay Yay…. ? Good question, Sharon. I’m working on an article today about botulism. From what I understand so far, oxygen and acid are botulism’s enemies, so as long as one or both are present, the foods should be okay. Cooking with herbs in oil is fine, apparently, but we wouldn’t want to let oil-cooked foods sit at room temperature a long time. I had no idea this could be so dangerous. I often add rosemary and other fresh herbs to french fries, while I’m still frying them. So I guess that’s not good, right? From what I understand, Galanda, cooking with these herbs while using oil is fine, since oxygen is present. To be extra safe, adding an acid, such as vinegar, lemon juice or lime juice can help retard the growth of the C. botulinum bacteria. One more reason to love salt and vinegar fries! In any case, we should either consume foods cooked with oil and fresh herbs immediately or refrigerate and use fairly soon so any botulinum organisms cannot multiply. As mentioned in a comment earlier, I’m working on a new post about botulism today. I will see if I can find a definitive answer to this question.